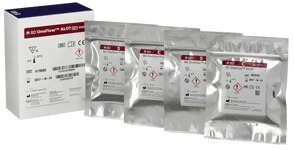 Specifically designed to address the challenges of a clinical laboratory during the pre-analytical and analytical phases, BD OneFlow™ solution maximizes laboratory efficiency by reducing manual workload, eliminating the need for antibody pipetting and minimizing the risk for operational mistakes and testing repetition. It simplifies the process of instrument standardization, reducing the need for staff training. Provided in a ready-to-use, dried, single-test tube format, BD OneFlow antibody reagents allow for direct specimen staining, eliminating the need for antibody pipetting, minimizing operational mistakes and the risk for testing repetition. Antibody inventory management is simplified by reducing the number of antibody vials to be monitored as well as the antibody waste of expired and/or not frequently used antibodies. Featuring room temperature storage, the BD OneFlow reagents eliminate the need for preserving cold-chain shipment and storage, delivering stable products with extended shelf life. The BD OneFlow antibody reagents are designed as pre-configured, single-dose, ready-to-use 8-color reagents, which are provided as a single-test tube format in an optimized dried formulation. The BD antibody reagents can be stored at room temperature for laboratory convenience. The BD OneFlow™ ALOT (Acute Leukemia Orientation Tube) is a pre-configured single-dose, ready-to-use 8-color reagent. Two tubes, one containing the cytoplasmic markers (C tube) and one containing the surface markers (S tube), provide a single-test. The BD OneFlow ALOT is intended for flow cytometric immunophenotyping of aberrant immature populations of hematopoietic cells (lymphoid and non-lymphoid lineage) in bone marrow and peripheral blood as an aid in the diagnosis of acute lymphoblastic leukemia and non-lymphoid acute leukemia. As a screening tube, the BD OneFlow ALOT can guide the need for further analysis in combination with panel(s) specifically designed for the classification of different forms of B, T and myeloid acute leukemias. 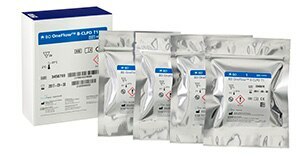 The BD OneFlow ALOT is available in the 10 test/box size (4 pouches of 5 tubes each: 2 pouches of S tubes and 2 pouches of C tubes). Dark red color-coded boxes, pouches and tubes allow for easy visual identification. The reagent composition is shown below. CD34 PerCP-Cy™5.5 8G12 S Backbone marker (B-ALL and AML panels). CD19 PE-Cy™7 SJ25-C1 S Backbone marker (BCP-ALL panel). CD3 APC-H7 SK7 S Backbone marker (T-ALL panel). CD3 Horizon™ V450 UCHT-1 C Backbone marker (T-ALL panel). CD45 Horizon™ V500-C 2D1 S Backbone marker. For more information, please refer to the Instructions for Use available in 24 languages. The BD OneFlow LST (Lymphoid Screening Tube) is a pre-configured single-dose, ready-to-use 8-color 12-antibodies reagent, that is provided as a single-test tube format. The BD OneFlow LST is intended for flow cytometric immunophenotyping of normal and aberrant mature lymphocyte populations of B, T and NK cell lineages in peripheral blood, bone marrow, and lymph nodes, as an aid in diagnosis of haematological disorders. As screening tube, the BD OneFlow LST can guide the need for further analysis in combination with panel(s) specifically designed for the classification of different form of malignancies (B, T or NK). The BD OneFlow LST is available in the 20 test/box size (4 pouches of 5 tubes each). Dark blue color-coded boxes, pouches and tubes allow for easy visual identification. The BD OneFlow™ B-CLPD T1 (B-cell Chronic Lymphoproliferative Diseases Tube 1) is a pre-configured single-dose, ready-to-use 8-color reagent that is provided as a single-test tube format. The BD OneFlow B-CLPD T1 tube is a classification tube that is used for specimens with B-lineage populations needing further investigation in combination with the BD OneFlow LST (Lymphoid Screening Tube). The BD OneFlow B-CLPD T1 is intended for flow-cytometric immunophenotyping of B cells in peripheral blood and bone marrow as an aid in the diagnosis of chronic lymphocytic leukemia (CLL) and other B-cell chronic lymphoproliferative diseases. It is available in the 20 test/box size (4 pouches of 5 tubes each). Boxes, pouches and tubes are color coded with a lighter blue color than the one identifying BD OneFlow LST, allowing for reagent visual identification. The blue color (dark and light) identifies the BD OneFlow B-cell Chronic Lymphoproliferative Disease Panel. The BD OneFlow Plasma Cell Disorders panel comprises two 8-color tubes, 12-markers in total. 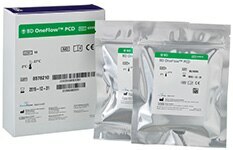 Both reagents – BD OneFlow PCST and BD OneFlow PCD – are available in the 10 test/box size. The BD OneFlow™ PCST (Plasma Cell Screening Tube) is a pre-configured single-dose 8-color reagent, made of two tubes: one containing the cytoplasmic markers (C tube) and one containing the surface markers (S tube). The BD OneFlow PCST is intended for flow-cytometric immunophenotyping of normal polyclonal and aberrant plasma cell populations in bone marrow as an aid in the diagnosis of hematological disorders. 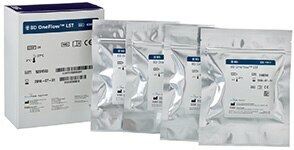 It is available in the 10 test/box size (4 pouches of 5 tubes each: 2 pouches of S tubes and 2 pouches of C tubes). Dark green color-coded boxes, pouches and tubes allow for easy visual identification. The BD OneFlow™ PCD (Plasma Cell Dyscrasia) tube is a pre-configured single-dose, ready-to-use 8-color reagent. The BD OneFlow™ PCD tube is a classification tube that shall be used for specimens with plasma cell populations needing further investigation as determined by the BD OneFlow™ PCST (Plasma Cell Screening Tube). The BD OneFlow PCD tube is intended for flow-cytometric immunophenotyping of normal and aberrant plasma cells in bone marrow as an aid in the diagnosis of multiple myeloma or other plasma cell disorders. It is available in the 10 test/box size (4 pouches of 5 tubes each). 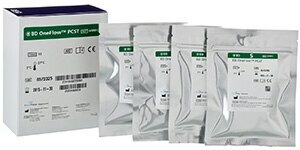 Boxes, pouches and tubes are color coded with a lighter green color than the one identifying BD OneFlow PCST, allowing for reagent visual identification. The green color (dark and light) identifies the BD OneFlow Plasma Cell Disorder (PCD) Panel. Specifically designed for BD OneFlow assays, the BD OneFlow assay setup increases efficiency by simplifying instrument standardization, drastically reducing time to results as well as the technical burden and training needs. In association with BD FACSDiva™ CS&T IVD beads and Application Setting module, BD OneFlow Setup Beads deliver daily standardization control and instrument performance monitoring . With a simplified procedure for standardizing 8-color compensation, BD™ FC Beads drastically increase laboratory efficiency by minimizing training needs. Available as ready-to-use 3-μm polystyrene beads coupled to fluorochromes and dried in single-use 12 x 75-mm tubes, BD FC Beads eliminate the need for using single-vial reagents as well as label-specific compensation, minimizing the process time for full 8-color compensation. Hammerling JA. A Review of Medical Errors in Laboratory Diagnostics and Where We Are Today. Lab Med. 2012;43(2):41–44. Plebani M, Carraro P. Mistakes in a Stat Laboratory: Types and Frequency. Clin Chem. 1997;43(8):1348–1351. J.J.M. van Dongen, L. Lhermitte, S. Böttcher, et al on behalf of the EuroFlow Consortium (EU-FP6, LSHB-CT-2006-018708). EuroFlow antibody panels for standardized n-dimensional flow cytometric immunophenotyping of normal, reactive and malignant leukocytes. Leukemia 2012, 26 (9): 1908-75. T Kalina, J Flores-Montero, VHJ van der Velden, et al on behalf of the EuroFlow Consortium (EUFP6, LSHB-CT-2006-018708). EuroFlow standardization of flow cytometer instrument settings and immunophenotyping protocols; Leukemia 2012, 26 (9): 1986-2010. Cy™ dyes are subject to proprietary rights of GE Healthcare and Carnegie Mellon University and are made and sold under license from GE Healthcare only for research and in vitro diagnostic use. Any other use requires a commercial sublicense from GE Healthcare Corp, 800 Centennial Avenue, Piscataway, NJ 08855-1327, USA.